You will struggle to go hungry on a visit to Belgium. There's just too much on offer. Belgians love good food; I'm told that, apart from their cars, eating out is what they spend their money on. And yet, somehow, it's looked upon as a place where all there is to eat is frites and mayo, and mussels. That does the country a tremendous disservice. Although it isn't hard to find a frituur if you want a quick snack (and the Belgians treat the frite with such reverence that there's even a museum dedicated to the humble chipped potato in Bruges) there's a head-spinning variety of eats on offer. Bruges itself, a tiny town of less than 200,000 citizens, has 400 restaurants, including a Michelin-starred joint. There's something for every taste and budget. The humble mussel is a big part of Belgian cuisine, but it's offered in many different ways. From the classic wine and sweet aromatic base, to curry and cream, to steamers in a local beer, there's nothing more pleasant than a huge pot of mosselen — with frites to dunk in the sauce, of course. But bear in mind that seafood is a must in Belgium too. Bruges is a ten-minute train ride from the sea port of Ostend, and features a daily fish market. It's worth spending the extra on the catch of the day, because it won't get much fresher. Belgians are great believers in the restorative qualities of a huge slab of meat. Their cows produce beef that is sweet, dense and deeply flavoured. The steaks on offer at even the humblest restaurant are thick and juicy. Bear in mind that they view the notion of 'well-done' with deep suspicion. It's worth ordering your steak a step or two more cooked than you'd usually like it — medium-rare will be bloody as hell. Chicken, however, is looked upon as a bit of an oddity to the Belgian palate — not quite meat or fish. You'll tend to find it in grill-restaurants like the brilliant, eccentric Arthies (the ribs come in a fiery dry rub with garlic butter on the side, and it's worth having one of their Death's Head beers to cool the fire, served up in skull-glasses) that specialise in chicken and ribs, but it's unlikely that Nandos will be opening up in Belgium any time soon. It's the same with burgers. Quick seems to cater exclusively to tourists, and a gourmet burger joint is getting ready to open in a quiet square a five-minute walk from the Markt, but that's about it. The Belgians don't want to mess around with their meat. Wipe its bum, slap it on a griddle and tuck in. The one exception to that rule is the slow-cooked beef stew known as carbonnade Flammande. This unctuous concoction is braised in a local beer (which means that the flavour of the dish varies from region to region) for hours, before being served with the inevitable frites to mop up the gravy. There's no fat or gristle, just meat that falls gently apart at the touch of a fork. You can find it everywhere, and you really should try it. 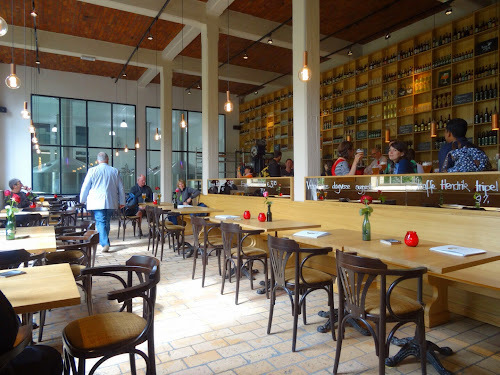 Food and beer pairings are nothing new in Belgium, of course, and restaurants like Den Dyver specialise in cooking with beer, and offering the perfect brew to drink alongside. Rob contemplates the future... which clearly contains beer. 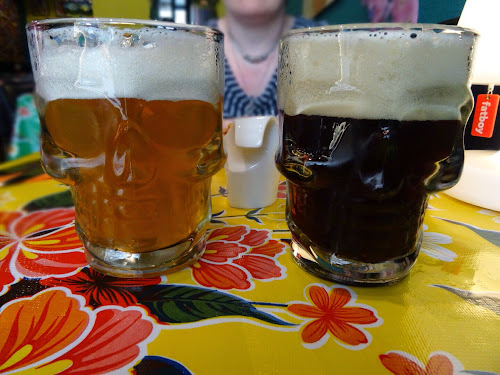 Let's talk a little about beer, the other Belgian obsession. There are 1200 distinct brews from a good few hundred breweries. It's a bewildering choice, made even more so when you consider that each beer comes with it's own branded glass, some so fancy that you'll have to pay a deposit (or leave a shoe behind the bar) if you want to try them. 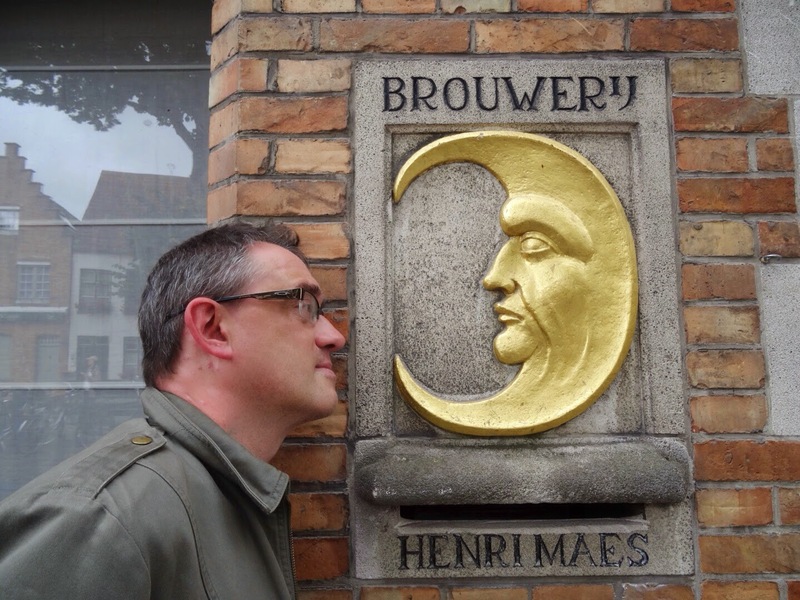 It's very easy to become a beer nerd in Belgium — in fact it's almost a crime in my eyes to stick to Jupiler on tap or, god forbid, Stella Artois. From thick, dark Trappist dubbels or tripels to a bright, sharp wild-fermented gueuze, there's very little chance that you'll repeat yourself. If you're in Bruges, it's worth visiting De Halve Maan (Half-Moon) Brewery to try Bruges Zot, the most local of local brews. Although most bars in the town sell it, the brewery bar is the only place that will sell Zot on tap and unfiltered — and it's cheaper there too. The bar at De Halve Maan. If you want to check out the full, dizzying range, get yourself to the basement of the 2Bshop, where four rooms are stocked floor to ceiling with everything from Aardbeien Lambic to Zulte Oude Bruin. At the beginning, I mentioned that you're unlikely to go hungry in Belgium — you're even less likely to go thirsty. It would be foolish to write about food in Belgium and not mention chocolate. In Bruges it seems as if some shopping streets are almost exclusively dedicated to shops selling the stuff. It's worth noting, though, there are only a few shops that actually make chocolate on the premises. One, The Chocolate Line, supplies sweets to Heston Blumenthal, and outré flavour combinations like bitter Coca-Cola and cannabis are there for the taking. However, it's always packed and very pricy. You're better off checking out Pralinette, whose 'fine and noble chocolates' pack a real punch of flavour without hammering the wallet. I snagged a chunk of cooking chocolate as well — well, it's what I do, isn't it? Our four days in Bruges covered a full range of culinary experience, from posh to funky mid-price to frites, eaten on a bench. We didn't have a mouthful of duff, poor quality food. If you're a foodie, you owe it to yourself to spend a weekend in Bruges, Brussels or Antwerp. Your diet and wallet might not thank you afterwards, but it's one hell of a ride while it lasts. Previous Previous post: The Pod Of Future Cast!